Recipes for Sun catcher popsicles, Sun cubes, Sunny fruit plates and a Sunshine Smoothie are all found on the post I created exclusively for How Does She. I really love this heartwarming idea of sending someone a box of sunshine! Click here for more details on this adorable gift from the happymoneysaver.com. 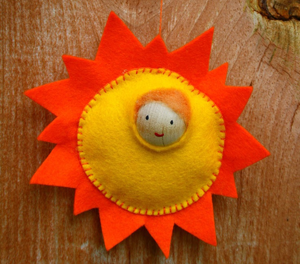 Make this sun child craft from the blog twig and toadstool.